If you look into his eyes, it is obvious that David Katz was not fully there anymore. Was he always that way? But after years of being doped up on anti-psychotic and anti-depressant medications, he was almost certainly a much, much different person than he had been originally. Other gamers at the tournament said Katz was rather quiet. 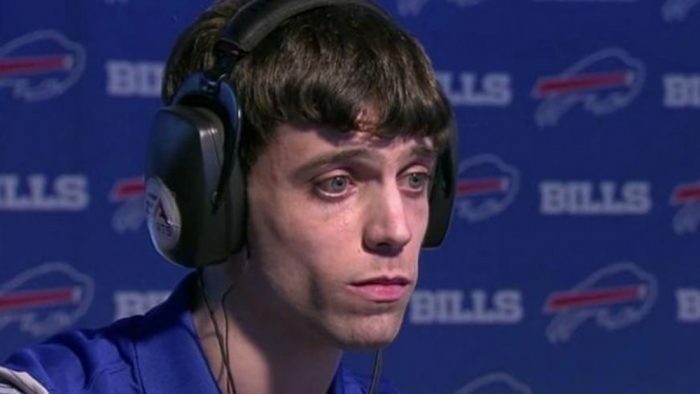 Shane Kivlen, a friend of one of the people killed, said Katz didn’t talk much with fellow gamers, either online or when they met face-to-face for Madden tournaments. He said much of what he and others knew of Katz, they learned from his baffling style of playing the game. The truth is that Katz wasn’t just nerdy. He had been transformed into a total nutjob, and everyone around him thought that he was really creepy. But if he had never been drugged into oblivion, things may have turned out very differently for him. So why don’t we start demanding that the real criminals behind this mass shooting epidemic be held responsible? CCHR International’s investigation into school violence reveals that at least 36 school shootings and/or school-related acts of violence have been committed by those taking or withdrawing from psychiatric drugs resulting in 172 wounded and 80 killed (in other school shootings, information about their drug use was never made public — neither confirming or refuting if they were under the influence of prescribed drugs or undergone other behavioral therapy.) At least 27 international drug regulatory agency warnings have been issued on psychiatric drugs being linked to mania, violence, hostility, aggression, psychosis and homicidal ideation (thoughts or fantasies of homicide that can be planned). If we were to simply take all young people off of these drugs, the number of mass shootings would go way, way down. Unfortunately, the medical system in this country is dominated by the big pharmaceutical companies and the big health insurance companies, and there are billions upon billions of dollars on the side of those that want to keep things just the way that they are. So we can keep spreading the truth, but it will be an uphill battle. In the end, it is quite ironic that Katz was the one that completely lost it mentally. And this kind of thing is going to keep happening as long as the medical community continues to pump our young people full of anti-psychotic and anti-depressant medications. It is one of the big reasons why the suicide rate in this nation has absolutely skyrocketed, and it is one of the big reasons why mass shootings have become a very common occurrence in America. According to Time Magazine, the use of anti-depressant drugs increased by nearly 65 percent between 1999 and 2014. And it has been reported that the pharmaceutical corporations spend more than 6 billion dollars a year on advertising. Those are the real numbers that everyone should be talking about, but unfortunately the mainstream media is completely silent on this issue.